Chase went to the dentist this week for his first dental exam and cleaning. The dental hygienist and the dentist both did a great job with him, first explaining what each tool was for (which my little engineer was very interested in. of course). This took the mystery out of their purpose so he was very willing (although still his usual cautious little self) to let her use each instrument in his mouth. The only thing he was not ok with was sitting in the big chair that tilted back. Ever the super-cautious child, he is very smart in knowing when he is not in control of something. That chair that the lady tilted back was not in his control and he didn't like it one bit. He felt more in control of his Mama's lap. So that's where he sat during the exam part. I know I post (and talk) a lot about how great Chase is and all the wonderful things he's doing. But I like to also keep it real. And keeping it real involves also sharing the moments where Chase does things that aren't so wonderful. Like pushing other kids. Here's a note that was written to us from his teachers last week. Not that pushing other kids is a laughing matter. But I did laugh (not in front of the teachers of course) a little. Of course we talked to Chase about how this is not okay. He understands and this is normally not a problem. We went ahead and picked up this cute dragon costume when we saw it a few weeks ago, confident (even though he wasn't with us at the time) that he'd love it. We were correct. He loves it so much that he insisted on wearing it to bed last night. 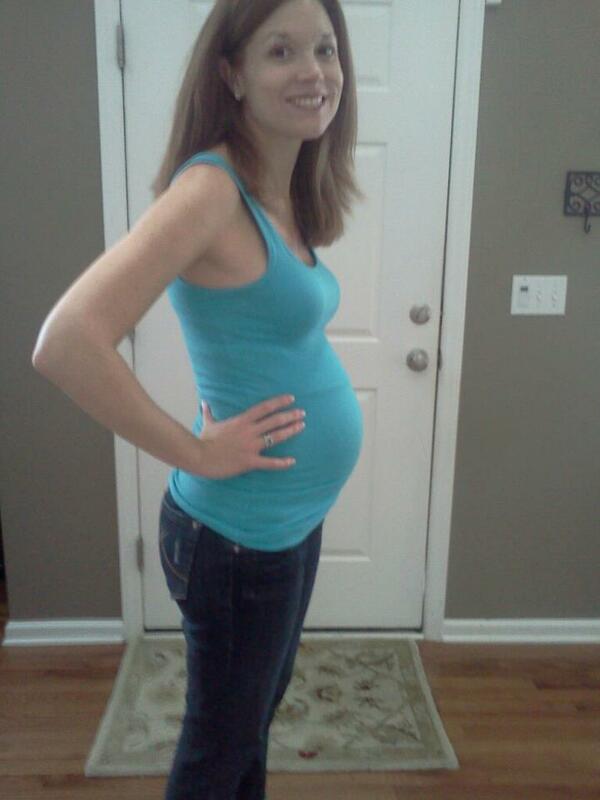 23 weeks, here we are! It's not really going as quickly as I'd hoped but I still don't think I'm in any position to complain. I'm feeling bigger but overall pretty good. According to babycenter.com, our little guy is currently measuring about 11 inches and weighing in a little over a pound. Basically about the equivalent of a mango. this is just some random woman holding a mango, by the way. With the discovery of pinterest I have realized that maybe I don't hate 'crafts' as much as I thought. I'm not very creative at ALL but I have discovered that I can just 'borrow' other people's ideas. Sometimes I even get crazy and change them a little bit. Maybe I'm more creative than I thought. I've been collecting things for my various projects over the last few months. I absolutely love yard sales and thrift shops. It's one of my guilty pleasures. That and coupons. Oh and food network. I found this silver tray for 50 cents at a yard sale recently. I've discovered that in addition to yard sales, thrift shops, coupons and food network, I also have a love for chalkboard paint. I'm always trying to find things I can use my chalkboard paint on in our house. I think Matt's a little nervous. In fact, I know he's nervous. But this project turned out ok, right? I painted the tray, cut some ribbon and then hot glued the ribbon to the back. This past Tues. I dropped Chase off at daycare and he ran off to play with his friends with a smile on his face, ready to start the day. About 3 hours later, I got a call from his teacher saying that he had a fever. His temperature was 102 and he hadn't eaten any of his lunch. So I ran in to tell my boss that I wouldn't be able to make my afternoon meeting and headed out to pick up my little boy. 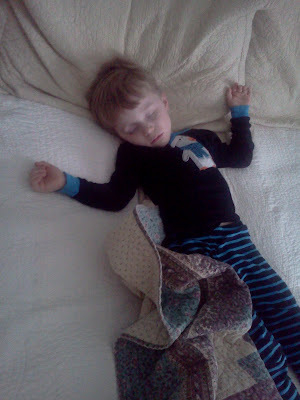 When I got to school he was fast asleep on the child-size couch, asleep with sand in his shoes, on his back, out like a light. 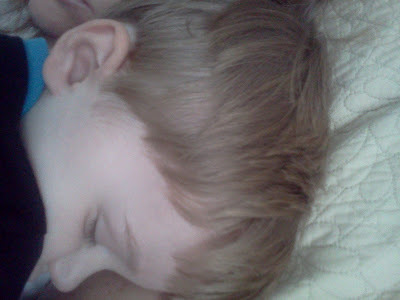 I scooped him up and when he opened his sleeply little eyes and said, "Mommy? I don't feel so good" I about cried. So we went home and spent the afternoon reading books, cuddling and this sick little boy slept and slept. I enjoyed all the cuddles but I did not enjoy seeing my usually energetic child laying with head on the couch, not feeling good. Breaks a Mama's heart. Luckily, he recovered almost as quickly as he got sick. In fact, I think he's even started figuring out how to work us by saying he doesn't feel good. He got to sleep with us an extra night (don't judge), got to go to Bebe's an extra night and would've stayed home another day with Matt or me if we'd been able to skip the day of work. That didn't happen so today was his first day back at 'school'.